What began as a little taste of home, is now a bustling business for one dairy farming family. In 1986, the Duivenvooden family immigrated from the Netherlands to start farming in Canada. After settling on a dairy farm in New Brunswick, the family found that the traditional Gouda cheese they were used to in Holland, was hard to come by on the East Coast of Canada. They began making their own cheese using fresh milk from their dairy cows. “Soon the community caught on and before we knew it people were coming to the door to purchase our cheese!’ Hetty Smyth (Class of ‘01) smiles. 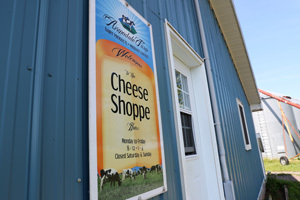 Armadale Farm Dairy Products, located in Sussex, New Brunswick, is home to 100 dairy cows whose fresh milk is used to make a variety of fresh artisan cheeses. While Hetty and her husband, Ian, oversee the dairy processing plant, Hetty’s brother, Hubert Duivenvoorden, owns and oversees the dairy farm. It’s those happy, healthy cows that produce such high quality dairy products for customers of Armadale Farm to enjoy. In 1990, not long after the family immigrated to Canada, the cheese plant came into existence. Although the plant opened in 1990, Hetty’s family had been making cheese long before that. Upon settling in New Brunswick, Hetty’s father, a fifth generation cheesemaker, purchased some used equipment to begin making cheese in the basement of their farmhouse. Soon, the business began to grow, resulting in the construction of a full cheese plant. Each morning, fresh, warm milk is pumped directly from the cows to the cheese vat and pasteurizer. From there, different varieties of cheese are produced through an intricate process. Each variety of cheese has a slightly different production process as each variety has different requirements and characteristics. A common product at Armadale Farm Dairy Products is traditional Dutch Gouda cheese. The process of making Gouda cheese begins by adding culture, which raises the acidity of milk by consuming the lactose, to the fresh milk. An enzyme called rennet is also added to help the milk curdle. The milk then sits for 45 minutes to allow for coagulation. The cheese curds are cut and some of the whey, the liquid remaining after milk has been curdled and strained, is removed. Next, hot water is added and the mixture is stirred for 20 minutes. This process is repeated twice to raise the temperature of the curds. The excess whey is drained, leaving the cheese curds in the vat. If necessary, spices are added. The final step in the cheese making process is to press the cheese. The curds are placed into molds and pressed evenly for three hours and then turned so that both sides are evenly pressed. Once pressed, the cheese sits overnight to bring the pH level down before the brining process. The cheese is put into a brine tank for two days where a salt brine adds flavour to the cheese. Although Gouda cheese is their specialty, the dairy processing plant offers an extensive selection of handmade, quality dairy products. 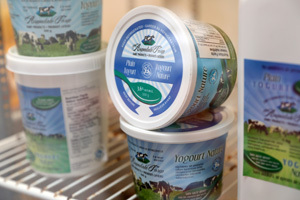 Cheddar, Feta, Havarti, and Parmesan cheese, cheese curds, dips, quark, sour cream, yogurt and ice cream can be found at their on-site cheese shop, Fredericton Boyce Farmers Market, Dieppe Farmers Market as well as various country markets and stores in Southern New Brunswick. Although their cheese making business is booming, it hasn’t always been easy getting to where they are today. They faced challenges as any farming business would, especially the high costs of production and overhead costs as Armadale Farm is so small compared to large dairy processing plants. Overcoming their challenges has certainly been worth it though. It’s not hard to tell that farming is important to the Smyth family and they are proud of their dairy processing operation. And while Armadale Farm Dairy Products strives to provide fresh local products for their customers, their dedication to their community goes far beyond that.